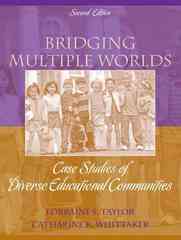 Bridging Multiple Worlds: Case Studies of Diverse Educational Communities 2 Edition This text offers “real world” case studies involving educational staff, students, and families from diverse backgrounds in a variety of dynamic school settings. Bridging Multiple Worldsemphasizes long-term, comprehensive solutions that promote school, home, and community partnership to meet challenges in educational settings. The text provides foundational information about diversity in the US, multicultural education, and family-school-community partnership in Part I; moves on to explore the use of cases in teacher education and how to analyze cases using a “decision making scaffold” in Part II; and delves deeply into specific cases and the issues surrounding them on a wide range of diversity topics in the seven chapters in Part III.